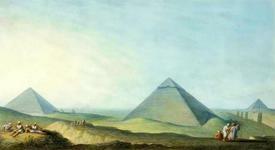 The Great Pyramid of Giza is considered to be one of the greatest ancient Egypt mysteries of all time. This particular pyramid is also known as the "Pyramid of Khufu" and many refer to it as the "Pyramid of Cheops". When it comes to the three pyramids in the area of the border that is known as the "Giza Necropolis", this pyramid is considered to be the absolute oldest. The Great Pyramid of Giza is considered to be one of what is known as the "Seven Wonders of the Ancient World". As a matter of fact, it is the only one of these seven wonders that is the most intact. In this reference guide, you will learn why this is considered to be one of the greatest ancient Egypt mysteries of all time. This magnificent pyramid is believed to have initiated as a tomb for the Egyptian King known as "Khufu". In Greek, his name was translated as "Cheops". He was in the fourth dynasty of kings for the Egyptian people. It is believed that individuals worked on this extravagant tomb for a period of two full decades. It is believed that construction was finished in or around the year identified as 2540BC. For a period of approximately four thousand years, the Great Pyramid of Giza was considered to be the tallest structure made by man in the world. These facts lend to the point that this structure is considered to be one of the greatest ancient Egypt mysteries of all time. Individuals throughout history have contemplated how individuals in ancient Egypt could have constructed such a massive, highly durable, and precise pyramid without the modern technologies that those in construction and architecture have at their disposal today. A famous historian that Greek named Herodotus evaluated the structure for quite some time and firmly believed that the pyramid should have taken no less than thirty years and a work crew of approximately one hundred thousand slaves to finish it. There are many others that believe that the Great Pyramid of Giza was constructed by something other than humans. This is especially true since the pictures acquired from the Viking Space Probe in the year of 1976 revealed that the "Cydonia" region of the planet Mars displayed a face that appeared to be human based along with a set of pyramids similar to those found in Egypt. The dimensions of this pyramid are amazing. It has four triangular shaped sides that cover an astonishing thirteen acres. Originally, the structure was four hundred and eighty five feet high, but now stands at four hundred and fifty feet. The length of the sides comes in at seven hundred fifty five point five feet in length. 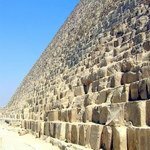 There is said to be two point five million blocks that make up the pyramid and each block has an average weight of two tons to over seventy tons. If you evaluate a compass to identify true east, west, south, and north, you will find that the four dimensions of the Great Pyramid of Giza align perfectly with these true directions. This, in itself, is one of the greatest ancient Egypt mysteries - especially considering the time frame in which it was constructed. Even more amazing when it comes to the construction of the Great Pyramid of Giza is that if you were to measure it in accordance with all other landmasses located throughout the world, you would quickly discover that it is the exact center of all the landmasses. Additionally, there are many astronomical based calculations directly related to this unsolved mystery. For example, if you were to measure the base of the Great Pyramid, you would find that the base measurement is 25.052 inches. Considering the Egyptians measurement of an inch is 1.0025 of the United States measurement of an inch, you will be interested to know that the total in standard measurement of the base is 365 - which are how many days are in a year. Now, if you measure the perimeter of the Great Pyramid of Giza, you will discover that it is an exact correlation of the entire circumference of the earth. If you were to take the 35th layer of the structure and multiply by the number of ten, you would get the distance between the earth and the sun. If you were to take the total inches of the perimeter of this structure, it would equal the number 36,524 - which just happens to be the number of days that is contained within a century or one hundred years. The famous Pi calculation is identified within the pyramid when you find the ratio of the height and multiply it twice the length of the area of the base. While identified as one of the greatest ancient Egypt mysteries, based on the questions that surround the Great Pyramid of Giza, it can be appropriately named as one of the world's greatest mysteries.